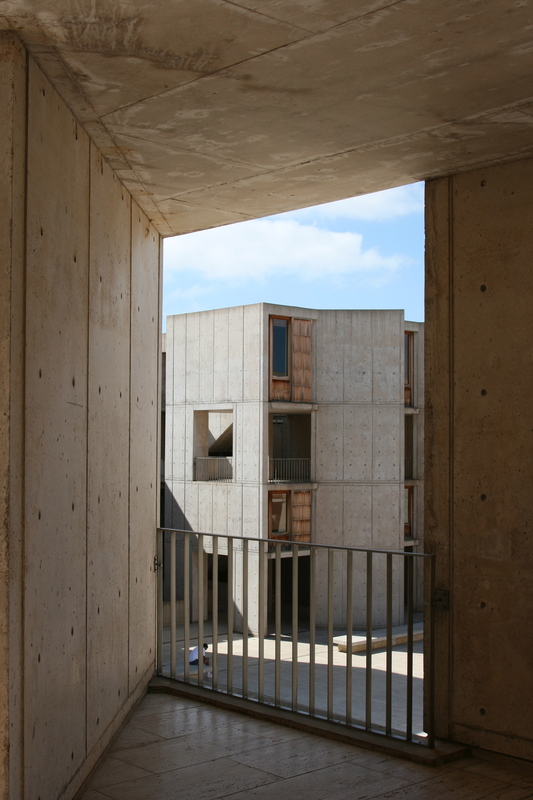 Salk Institute, San Diego | ride. travel. live. This is one of my favorite buildings, it sounds like a pretty charmed place to do science, unless you’re stuck in the basement. This was a design that occupied Louis Kahn for many years, although nothing like the very drawn out efforts he undertook in Bangladesh and India, or even his very recently finished Four Freedoms Park in New York. It’s 50 years old now, and every bit as striking today as ever. Kahn’s work doesn’t really fit into any category, but can be viewed as a reaction against the glass and steel and exposed structure of Mies. His buildings are not lightweight, but monumental, exuding mass and solidity, it’s not organic like Wright, the buildings don’t grow out of their surroundings, but stand apart. 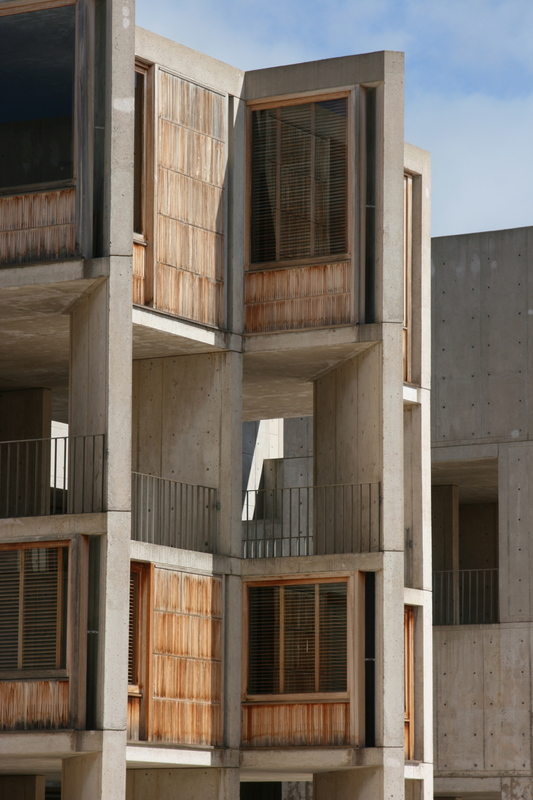 Kahn relies on the simplest of geometric forms, circles, cylinders, arches, rectangles, blocks. In doing so here, he’s put together a pair of mirror image structures that frame the Pacific Ocean and the sky. He’s managed to skillfully connect the building with its surroundings in several ways. 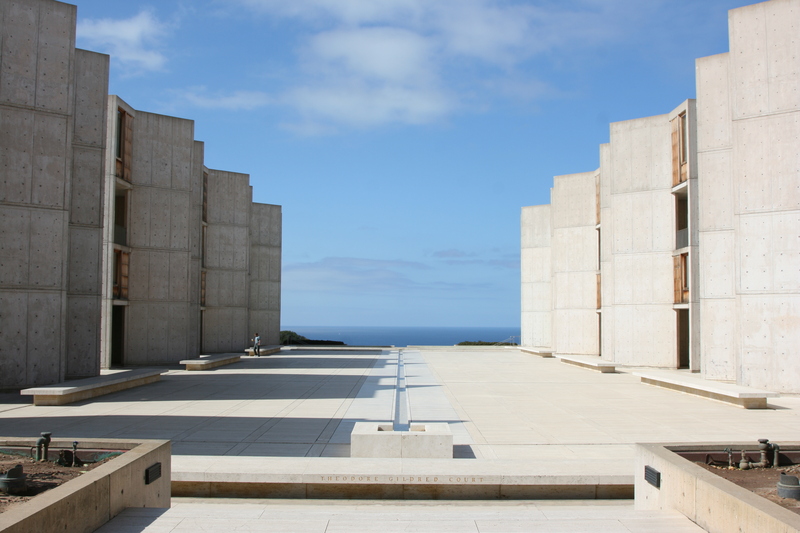 The studies for those lucky scientists, in these separate tower structures, all face the ocean, and standing in the courtyard, one naturally gazes towards the horizon, and even the central stream of water bisecting the courtyard runs towards the ocean. At the right time of day, that stream of water gives the visual impression of actually merging with the Pacific. That amazing view of the Pacific Ocean, with the stream of water in the center. View of the tower unit housing the studies. Closeup of the studies, weathered teak, glass, and concrete. The concrete mass is contrasted by the abundance of wood, teak that has weathered in the foggy, salty San Diego climate, and the travertine marble of the courtyard. Once you walk further into the building, a much more complex geometry emerges, still lots of concrete, but now plenty of glass, a basement level that still catches some sunlight, and many vantage points for the visitor and the people who work inside. This is a great, if unromantic, place to watch the sun set. I’m jealous — I would love to photograph this place! I work just down the street but have not had a chance to photograph it. Photographing Salk at sunset is definitely on my to do list.